India is a unique country that has ability of surprising foreigner on pretty much every step. Indian retail sector is noticeably different compared to the one in Europe. While living in India, I was pleasantly surprised of how efficient kirana stores really are. Although usually not impressive in size, they carry surpassingly large variety of merchandise. What’s more important, everything is available for almost instant home delivery. Ordering works especially well after some time, once the store owner gets to know your taste and preferences. Even phone ordering is not as inefficient as one would expect in the age of the Internet. India notoriously has a very low percentage of (estimated 7 % of the total) organized retail penetration. It is low even compared to other developing countries and incomparable to Europe’s 85 % level. Given the statistics no wonder that Indian retail sector is seen as a great business opportunity. However, despite the efforts from local and foreign giants alike, for multiple reasons kirana store remains dominant format in the market. Kirana store model is working so well in India because of several fundamental reasons. First, they provide goods on credit. It is extremely valuable service in a country where expenditures on food account for close to a quarter of all spending (in case of the poor – more than half) and banking services are not commonplace. Second, female employment is still relatively low, that allows spending more time for frequent shopping. Third factor is convenience. Kirana stores are usually small and located within a waking distance. And last but not the least, they offer truly personalized customer service. 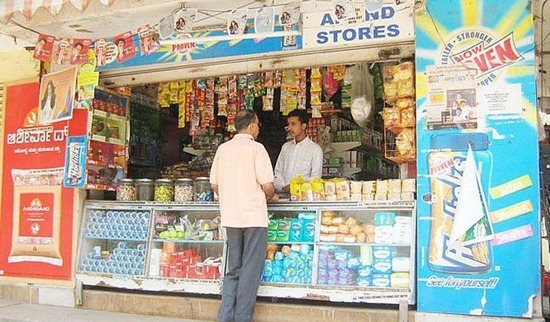 Kirana stores are dominating due to a set of conditions that are peculiar to India. Despite the perceived conditionality of success, this retail concept has a lot what it takes to be appealing in foreign countries, as well. If we look at the situation in the Eastern Europe , the seemingly unstoppable spread of supermarkets took place partly due to the lack of competition from retailers that are able of delivering such personalized shopping experiences. Small stores were operating basically as smaller versions of supermarkets, and thus, after more convenient modern supermarkets began to emerge, customers had no reasons to keep on shopping in their neighborhood stores. The potential of India’s domestic retail market is a widely debated subject. On the other hand, a reverse action of Indian retailers expanding abroad is not spoken much. The retail model of kirana store, if developed into a functional franchise, might have a disruptive power. I’m aware of the shortcomings of this model and that some of its strengths are relevant only within India. However, even if some aspects are not workable, kirana store offers an overall solid concept based a) on a low rent (due to small floor area required), b) personalized service, c) fast home delivery and d) customer credit (maybe it could be delivered in collaboration with micro-credit companies nowadays working so extensively in East Europe). The fact, that stores are unorganized and family owned, is not an unsolvable obstacle either. There are many examples of successful retail cooperatives (co-owned by members) expanding internationally. It is difficult to imagine Europeans changing their habits totally and stopping visiting supermarkets altogether. But if we look at daily grocery shopping, the demand for a more convenient and time efficient shopping experiences is already obvious. Kirana store could be one more great Indian innovation to surprise the world. Top 5 sites to watch Union Budget Live on Web! First of all the kirana stores are “Organized” Retail. Like in the case of Chennai most of the so called Kirana stores are actually multi-city family owned retail chains in Tamil Nadu. Even the smaller stores are actually ex-employees of working in the bigger kirana stores.So saying that they are not organized is not doing justice to them. They have the most profitable business model in retail. .It is just that supermarkets are non – existent in India and only now emerging.Whether they can become profitable on a large scale and succeed in taking away the customers from these kirana stores is what we would have to see. Reliance Fresh has made a start in this direction.Lets see what happens……………………..
Good day, thank you for your comment. I have used “organized” retail term in the way it’s most commonly used (not to say that I fully agree with the definition). No intentions to undermine the status of this hugely successful business. I do not have the data on how profitable Kirana store model actually is (If you possess any such data I would appreciate if you could share it with me). In any case it appears to be highly competitive. I share your views that it is difficult to predict if large-scale retailers will be successful in India and when if so. It might be that kirana store is dominating for completely different reasons rather than simply unavailability of super-markets. That point is the population density. You see, India is so densely populated that having a small store at every 100 steps works and provides sustainable income from the neighbouring houses. But the European countries are not so densely populated. From what I know, Europe is very much free from urban cramping unlike India and hence, a lot less people live per 1000 sq. feet than in India. Therefore, a kirana store in Europe will have a lot less nearby customers and hence, it might not earn good enough to make a living. And if gets too far away from home, people might actually prefer going to a supermarket rather than small store. Just my thoughts though! I might be wrong.. Thank you for insightful comment. It is true; India is much more densely populated compared to most of the European countries. This fact for sure affects the structure of retail. My point however was a bit different. The neighborhood store, as a concept is not new in Europe and quite successfully exists pretty much for centuries. What I was aiming to point, is that Kirana store has certain qualities that could enhance this retail model. In my opinion, the most valuable trait (and the one that has disruptive potential) is Kirana store ability to increase sales turnover (trough meticulous service, home deliveries etc.) without increasing the area of the store.